Smart solar energy producing DC micro-grids with remote managed hardware – SS20DC75 Managed. Efficient DC appliances powered by the DC micro-grid systems. 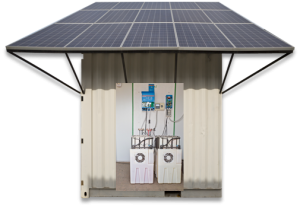 Online Off-Grid Energy Management Utility with remote switching, payment facilitation, vendor management, solar system and end-user management services – SSS-EPOWER. Using DC (direct current) technologies, rather than the more traditional AC (alternating current) ones, Specialized Solar Systems has been able to develop off-grid solar systems that are easy to install, safe to use in shacks (no open flames), made to the highest safety design specifications and are remotely manageable.